Harmonics are pitches produced by a string that vibrates in specific fractional divisions (Nodes). These are created by lightly touching the string in a place that is a fraction of the string length. Touching the string half way between the bridge, and the nut will create the first harmonic note one octave above the original string pitch. Touching the string at 1/3rd the string length will create a pitch that is an octave and a fifth up from the original string pitch (Ex. an A string would produce an E when lightly touched at 1/3 the string length). Touching the string at 1/4 the string length would create a pitch that is two octaves up. Technically this could go on forever, but at a certain point (usually after the fifth division) it becomes quite difficult to make a clear sounding note. 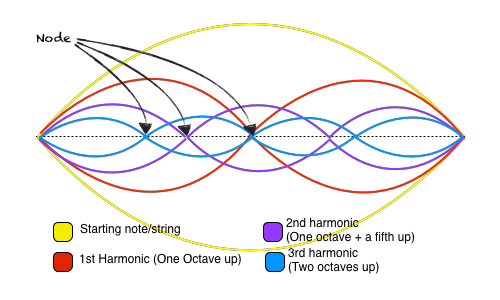 What makes harmonics different from regular notes is that the entire string vibrates. When you press the string down completely only the string between the finger, and the bridge vibrates. When you lightly touch the string at the specific fractional divisions the entire string from bridge to nut vibrates. Artificial (or stopped) harmonics are just like regular harmonics except that the vibrating string length is shorted by a finger (usually the index finger on violin/viola or thumb for cello/bass), and has another finger (usually the pinky) lightly touching the string creating a harmonic. If a violinist puts their first finger down on the D string as if playing the note E, and then touches the string with his fourth finger as if to play the note A the string would be divided in quarters, and play an E two octaves up. 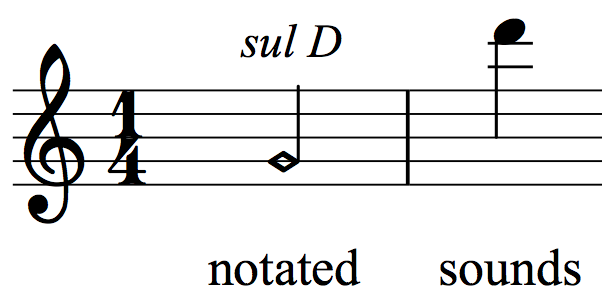 A harmonic can be notated in a few different ways. The first way would be to write the note that should sound with an "o" written above it (example 1.). A composer can also write where the finger should be placed to create that harmonic by writing a diamond for the note head (example 2.). Usually the composer will indicate what string the harmonic should be on with sul D or a roman numeral. For the diamond notation the composer may also write the open string/stopped note with a regular note and a diamond for the harmonic (example 3.). You can play the same harmonic note by touching the string near the bridge as well as near the nut (back of the fingerboard). The first harmonic is in the center of the string length (about one inch before the edge of the instrument body). Learning where the other harmonics are higher on the instrument just takes practice to gain the muscle memory, but playing them lower on the instrument is quite easy. The second harmonic (That divides the string into thirds) is right where the fourth finger is when playing in first position. The third harmonic is where the third finger is placed when in first position. Because harmonics will only sound on specific pitches, you can tune your strings fairly accurately by playing harmonics. The first harmonic of one string should be the same pitch as the 2nd harmonic of the string directly below it (For double bass it is second harmonic, and third harmonic of the lower string). If the A string is in tune and the first harmonic is played (center of the string) it should match the same pitch played when touching the 2nd harmonic on the D string. If the note on the D string sounds more flat compared to the A then you know that the string itself is flat, and can tuned from there.